Without the accumulated knowledge and development of peach rootstocks, the Florida peach industry would not be where it is at today. There are still many challenges facing peach growers, but with the experience of people like Tom Beckman, who has 30 years of peach research under his belt, solutions will be found in the near future. Beckman is a research horticulturist with the U.S. Department of Agriculture (USDA) Agricultural Research Service in Byron, Georgia. His background and knowledge of the history of peach diseases and rootstocks made him a good candidate to speak at the recent Stone Fruit Field Day in Citra, Florida. The problems facing the middle Georgia and South Carolina peach industries were different in 1988 when Beckman began his career. The problems, referred to as replant diseases, were found on old peach land. Replant diseases only get worse when growers plant the site over and over again with a particular crop, in this case peaches, which have been in this area since the late 1800s. So, they’ve had a lot of time to build up problems such as ring nematodes, which are indigenous throughout the Southeast, and their populations have built up to very high levels. The ring nematode is one of the primary predisposing factors leading to peach tree short life, which in 1988 was the number-one cause of premature tree death in the Southeastern peach industry. Things like Armillaria, a soilborne fungus, had the exact same pattern. “It’ll be there in a small place on an orchard, you’ll plant, and it’ll jump onto your peach trees,” said Beckman. “Armillaria has a very wide host range, so there’s many trees that this disease can attack. When the tree dies, you’ll rip it out, but many of the roots will remain in the soil.” All those remaining roots become a source of inoculum, as the organism infests what remains in the soil. In preparation, you can’t get rid of it and end up with a steady but slow buildup of inoculum that over time will infest a significant portion of a planting site. These were the problems Beckman was dealing with back in 1988. One might wonder why growers don’t simply abandon such sites. But according to Beckman, there are several reasons why peaches are constrained to certain lands. It largely has to do with preference for sites that are relatively frost-free in the spring. So, growers are very reluctant to move to new land, even if it is available in their production areas, if they perceive it as more prone to crop failure due to spring frosts. Florida was really a minor player in the peach game in 1988, with only a very small industry in North Florida that was mostly confined to local sales. Now, with the issues the citrus industry is having, a lot of citrus growers are looking for an alternative. 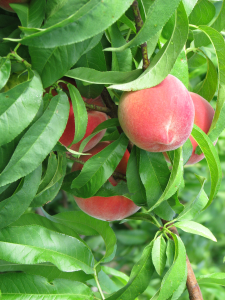 Since they are already involved with tree crops, they see peaches as a natural option. Consequently, much of the growth in the Florida peach industry has been in Central Florida, where peaches were virtually unknown previously. The original work that led to the development of Flordaguard rootstock was based on an assumption that researchers were looking at a unique race of M. incognita, which is one of the nematodes that attacks trees in Georgia and South Carolina. It became evident, after some years, that this could not possibly be a different race of incognita; it had to be something else. Upon closer look, nematologists realized that it was a previously undescribed species, one that is fully capable of attacking most of the rootstocks that Beckman works with. The sources of resistance for incognita and javanica nematodes that Beckman is working on in Georgia and South Carolina do not work for floridensis, a Florida nematode. Beckman’s mentor, Wayne Sherman, developed Flordaguard and released it in 1991. Problem solved? Not exactly. It now appears that Flordaguard is coming under attack by root-knot nematodes, particularly in the new production areas in Central Florida. Whether this is due to new races or species of root-knot nematode or Flordaguard’s resistance breaking down is uncertain at this time. What is known is that a renewed effort needs to be made to resolve the issue. Beckman is collaborating with colleagues at UF who are looking at a variety of options ranging from new approaches to suppress nematode populations to a new breeding effort, using modern molecular tools, to develop resistant rootstocks to counter this threat to the growing Florida peach industry.